Alternative remedies can be dangerous for children and even prove fatal if taken instead of conventional drugs, according to a new study. 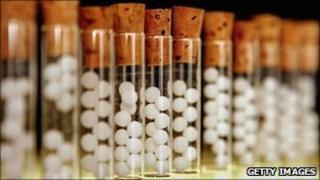 The report warns of possible adverse reactions in youngsters who are given alternative remedies. Researchers say parents sometimes think remedies are "more natural" with fewer side effects than conventional drugs. But in nearly two thirds of the cases the side effects were rated as severe, life threatening or fatal. The study, published in the journal Archives of Disease in Childhood, looked at 39 separate incidents reported to the Australian Paediatric Surveillance Unit between 2001 and 2003. The children ranged from babies to 16 year olds. In 30 cases, the issues were "probably or definitely" related to complementary medicine, and in 17 the patient was regarded as being harmed by a failure to use conventional medicine. The report says that all four deaths resulted from a failure to use conventional medicine. One death involved an eight-month-old baby admitted to hospital "with malnutrition and septic shock following naturopathic treatment with a rice milk diet from the age of three months for 'congestion'". "Another death involved a 10-month-old infant who presented with septic shock following treatment with homeopathic medicines and dietary restriction for chronic eczema," the authors say. One child had multiple seizures after complementary and alternative medicines (CAMs) were used instead of anti-seizure drugs due to concerns about potential side effects. The fourth death was of a child who needed blood-clotting drugs but was given complementary medicine instead. The study found that parents used alternative therapies to treat anything from constipation to clotting disorders, and diabetes to cerebral palsy. The authors, from the Royal Children's Hospital in Melbourne, said: "Many of the adverse events associated with failure to use conventional medicine resulted from the family's belief in complementary and alternative medicine and determination to use it despite medical advice." Dr William Van't Hoff, a consultant paediatrician and a spokesman for the Royal College of Paediatrics and Child Health, says this is an important, well constructed study that demonstrates "a high and unacceptable rate of adverse events" associated with the use of complementary and alternative medicine (CAM). "It's important to note that the four deaths related to the failure of the family to use conventional medicine. Probably the most important risk is that families abandon or delay the use of conventional medicine and rely on CAMs. "The second concern is that CAMs can interact with other medicines or have toxic effects. There's a presumption that these are natural remedies and families don't appreciate this and may even attribute the toxic effect to the conventional therapy." Edzard Ernst, Professor of Complementary Medicine at Exeter University, says it is well known that alternative therapies can have side effects, especially in vulnerable groups like children. "All of these treatments can have side effects but there's also a risk of alternative therapies replacing effective treatments. "So inert remedies like homeopathy, even though they in themselves are harmless, can be life threatening when they replace effective treatments. "Children don't make decisions themselves about their treatment; very often it is their parents, and parents can be misguided by the 50 million alternative medicine websites. The children are victims of lots of nonsense and false claims."